We round up everything that's gone on inside the O2 Arena for the 2015 BRIT Awards. 1. 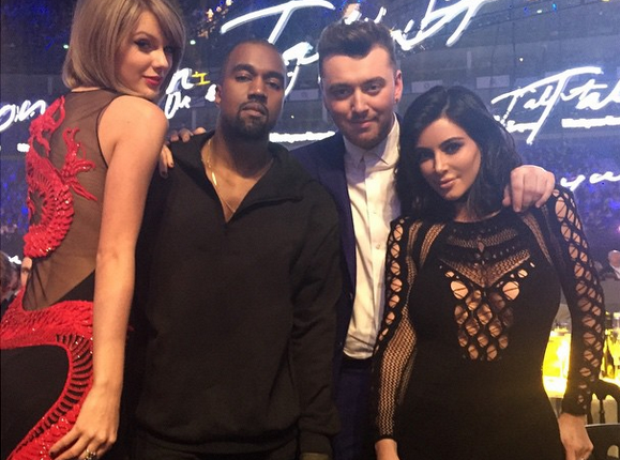 Taylor Swift, Sam Smith, Kanye West and Kim Kardashian were hanging at the BRITs. 2. It seems Kanye and Kim Kardashian passed on any of the huge after parties. 3. The hung out and took selfies instead. 4. Ed Sheeran Performed for guests at one of the huge after parties in London. 5. Rita Ora was seen dancing and having fun all night. 6. Mark Ronson and his wife stopped for a photo. 7. BRIT winners Sam Smith and Ed Sheeran shared a car the party. 8. Ed Sheeran's girlfriend attended the event with him. 9. Ant and Dec were sure to get a selfie with Kim Kardashian on stage. 10. Kim Kardashian was there to present Sam Smith with ANOTHER BRIT Award! 11. Kanye West took over with a performance of new song 'All Day'. 12. He was joined by Boy Better Know who represented the UK grime scene at the Awards ceremony. 15. He was presented with the award by Rita Ora and Orlando Bloom. 18. Ed Sheeran posed backstage with his two BRIT awards. 20. Pharrell wasn't there to collect his award but he did leave a video message. 21. Cara Delevingne looked amazing on the BRITs stage.